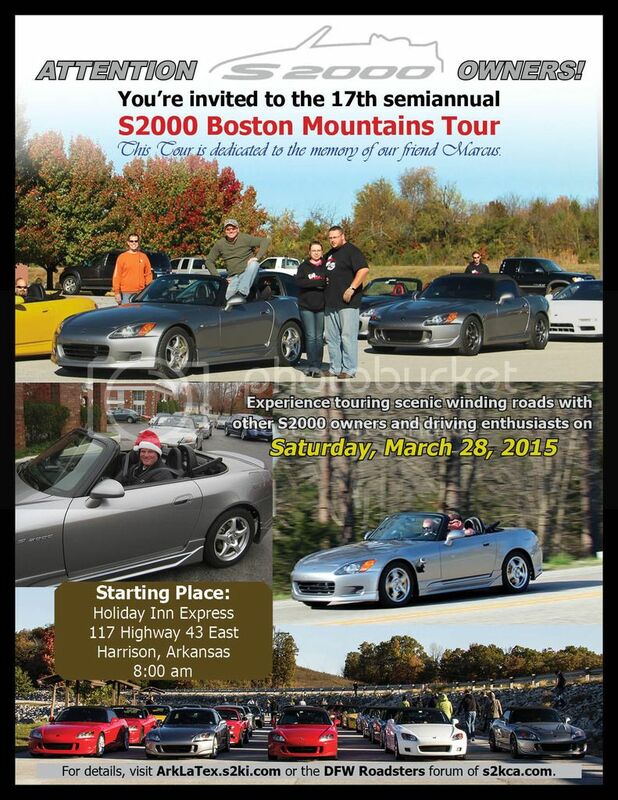 [b]Dear Friends, You are invited to attend the 17th Semi-annual S2000 Arkansas Boston Mountains Spring Tour 2015. The Spring 2015 Tour will cover some of the best winding and scenic roads that the Arkansas Boston Mountains range have to offer. These roads can offer something challenging to even the most experienced drivers. All drivers are given a tour packet, that will have your group number, route with turn-by-turn directions, lunch and dinner maps (if applicable). The Arkansas Boston Mountains Tour is one of the best environments for you to fully enjoy what your sports car was made to do, TURN! The BMT is a great social event as well, you have the opportunity to meet great people from across multiple states. We look forward to seeing you there! The 2015 Spring tour is dedicated in memory of our friend and long time BMT attendee, Marcus "Martini Marcus" Bastianen. Marcus was a staple in the BMT family and his memory will live on for future BMT's, and watch over us as we ride. 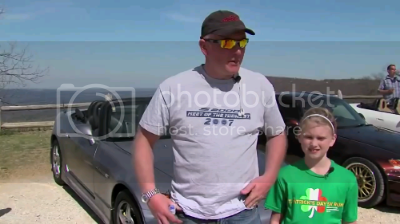 He is survived by his wife Vicki and two beautiful little girls, Kelsey and Kylie, Kylie has been his co-pilot and a great 2 way radio operator when Marcus was in sweep car position. Tour Start Time 8:30 a.m.
WE WILL BE ENDING BACK IN HARRISON, Make your reservations for two (2) Nights. We have a block of 10 rooms set aside, and have a group rate of $85.99 + tax / Night for a 2 Queen Bed Room or $105.99 + tax for a suite. Continental Breakfast is included in the price of the room. Reminders will be given periodically as we get closer to the event to inspect your: Car, Tires, Fluids, Brakes . Also be sure to arrive to the starting point with a full tank of gas. Please post your Name (Real Name), What state your attending from, if you will have a passenger (+1) and if you are confirming your attendance. Confirmed names will be bolded in the lists below. Blake from Missouri. No passenger as of right now. Confirmed. Put us on the list Andy! Looking forward to it! Ruiz + 1 confirming. Can sweep.